This spring blooming, native wildflower provides a welcome a splash of color early in the growing season. A member of the buttercup family (Ranunculaceae) and the flowers are a source of nectar for a variety of pollinators mid spring until early summer. Naturally found in woodland areas this species is easy to maintain and thrives in dappled shade but is highly adaptable with both light and soil conditions. It’s elegant bell-like flowers gently droop at the end of slender stalks. The salmon red outer spurs and sepals ( modified leaves which start out being green) has a hollow center surrounded by yellow petals that pokes out the bottom like a petticoat. The red spurs are actually extensions of the inner yellow petals. These hollow spurs hold the valuable nectar sought after by insects who possess the right anatomy to be able to reach in and find their reward. 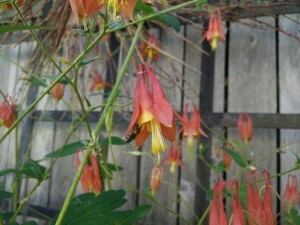 Native columbines look great either in a flower border with other plants that will fill in the height component after their stalks have been cut back, or incorporated in to a bed that has complimentary early blooming plants. After the flowers have completed their bloom cycle, the interesting three-lobed medium green leaves persist and still provide a healthy green design piece in the garden. You can let the seed heads dry and shake them about in areas you might want more, before you cut the stalk down. 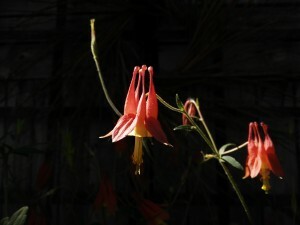 The wild columbine is a favorite source of nectar for returning ruby-throated hummingbirds. As for insect pollinators, it attracts a wide range of species of native bees, bumblebees, honey bees, butterflies and moths. It also serves as a larval host plant for the columbine duskywing butterfly and columbine borer moth.